2nd Battalion The Royal Gurkha Rifles (2 RGR) has won Nepal Cup 2013 with the score of 2 – 1 to Queens Gurkha Engineers(QGE) at Queens Avenue, Aldershot on 27 June 2013. 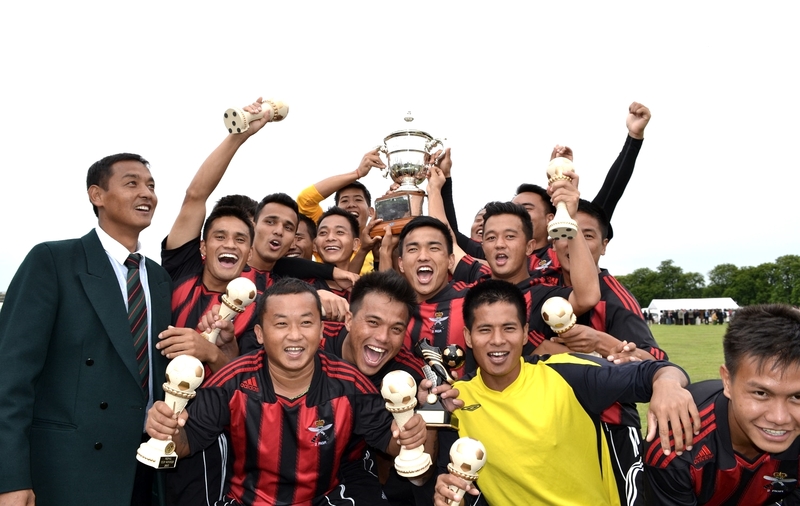 Likewise, veterans team from Queens Own Gurkha Logistics Regiment(QOGLR) clinched very first Kathmandu Cup 2013 with the score of 3 – 1 to Royal Gurkha Rifles(RGR). Lance Corporal Nirajan Budathoki (QGE) was awarded ‘Man of the Match’ and Rifleman Bisal Gurung (2 RGR) was awarded ‘Top Scorer’ for the Nepal Cup 2013. Similarly, Mr Santa Gurung (QOGLR) was awarded ‘Man of the Match’ and Mr Dipprasad Gurung (QOGLR) was awarded ‘Top Scorer’ for the Kathmandu Cup 2013. Note: More Pictures from Nepal Cup 2013.